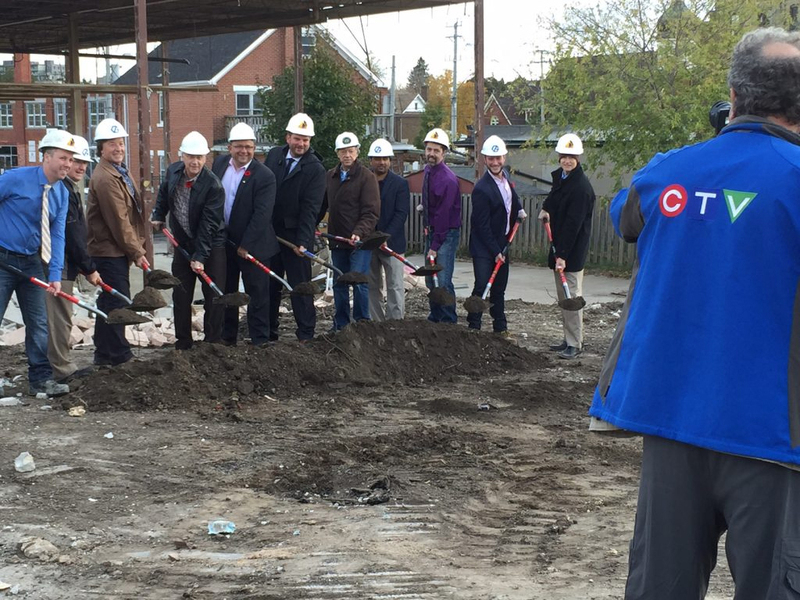 Kitchener Mayor Berry Vrbanovic and Regional Chair Ken Seiling were on hand today to celebrate the ground breaking of One Hundred (100 Victoria St S), a large condominium project consisting of two towers and 348 residential suites in the Innovation District of downtown Kitchener. A strategic development partnership between two local development groups – Momentum Developments and Zehr Group – was announced. After a lengthy OMB appeal that delayed the project by over 18 months, ground has now been broken on the first phase of One Hundred. The two towers will ultimately rise 15 and 19 storeys above a three-storey podium on Victoria Street. The first tower is slated for occupancy in late 2018. The second tower will be ready in 2020. The City of Kitchener’s approval of the project was upheld by the Ontario Municipal Board, and One Hundred is now set to contribute to the advancing landscape of Kitchener’s Innovation District. This past summer, Momentum Developments completed a 19-storey condo project at 1 Victoria St S. One Hundred is the first joint venture between Momentum Developments and Zehr Group, but the two teams previously worked together to develop the Red Condominium (188 King St S, Uptown Waterloo). This joint venture is a new approach, allowing local developers to satisfy the development needs of the Innovation District. One Hundred is now 70% sold in both phases and public demand for presale units has resulted in an updated design for the project, allowing 40 new residential suites to be added. The increasing demand for condominium living in downtown Kitchener can be attributed to the Region’s new Light Rail Transit system, which will soon provide rapid public transportation between the Tri-cities, as well as the increasing employment opportunities within the high-tech sector that is fuelling growth in Kitchener’s Innovation District. A planned multi-modal transit hub for the GO Train, Via Rail and Grand River Public Transit is also slated to be built on the corner of King and Victoria Street in the near future. Living at 100 Victoria Street will also give residents quick access to the many restaurants, shops and entertainment venues in downtown Kitchener. Visit onehundred.ca for more information. Our website uses modern web standards and practices, which makes it faster and easier for you to use on any device. Unfortunately, your browser doesn't support those technologies. Download one of these great browsers to get started. Momentum Developments is based in Waterloo, ON.